Is my life going to be exponentially more enjoyable because of STASH Coolers? While legally we cannot make any guarantees, it is probable. Can Coolers be punctured by hooks or sharp fish spines? It’s possible, but not likely. The cooler walls are constructed with military-grade, multi-layered reinforced surfaces, sandwiching a metallic and high-density foam layer. Can I inflate the coolers with bike pump or compressor pump? NO, it is not feasible to use these inflation devises. The rigid portion inflates very quickly, and using these types of pumps can lead to over inflation and product failure. Use of these pumps voids product warrantee. What pressure coolers be inflated to? 8-10 psi is the recommended level, using the included pump or a low-pressure foot bellows pump. How long will items remain cold in coolers? Regardless of the brand or type of cooler, there are many factors that contribute to longevity of ice in coolers, so there is no standardization for measuring the duration. Weather, amount of ice, how often it’s opened, sunlight, temperature of items in the cooler, size of ice – all of these can have an effect on how long ice remains frozen. In general, Stash coolers will keep ice longer than soft walled coolers, and not quite as long as high-quality hard walled coolers. What is Drop Stitch Material? Drop Stitch is a proprietary technology, where high-tech fibers act like I-beam columns, that when air is pumped into the chamber, make our inflatables extremely rigid. How should I care for my STASH cooler? We recommend cleaning it regularly with a dilution of non-abrasive, biodegradable dish soap and a light dilution of bleach. Can I leave it inflated for extended periods of time? Yes. It will maintain its shape and durability if kept inflated. Can I leave it in the sun for extended periods? Yes. The military grade, multi-layered fabric is UV protected. Are the coolers strong enough to carry from the handles fully loaded? Yes. STASH Coolers will support and carry their volume in weight. The A-Series feature an additional set of removable handles to allow four people to carry it fully loaded. What are some of the usage precautions? Do not drag coolers in rough hard surfaces. Do not use knives or sharp tools on the surface. Why are A Series coolers shaped in an A-frame style? 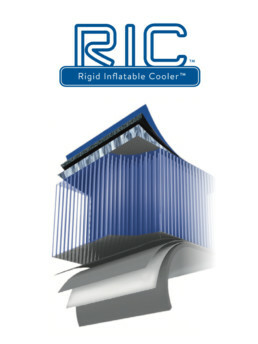 This patented cooler shape is to give it better stability while loaded. Yes they will, especially the larger A series models, and we have had some of our customers paddle the larger ones around. But it is not recommended, and any damage incurred will not be covered under warrantee. What do I do if a hole is punctured into my cooler? Each cooler comes with a patch kit. It is just like fixing a bike tube or raft, with a patch and cement adhesive. Yes. There is a two year warrantee for consumers and 90 days for commercial use, on manufacture’s defects only. It does not include normal wear and tear or abuse. My cooler smells like plastic – will this go away? Yes. Like new-car smell, it quickly fades.